What makes a special occasion special?…A special reason to celebrate, special people, special food, and, of course, a special outfit!! Many of us are going to a variety of festive get-togethers this holiday season. With these invitations comes the question, “What should I wear?” We want to help you get it right so you can avoid the dreaded “missed fashion opportunity.” Part of the fun of going somewhere can be getting dressed, but if you’re not feeling confident, it can totally steal your joy. Here’s three simple outfit formulas to help you dress for every level of holiday occasion! 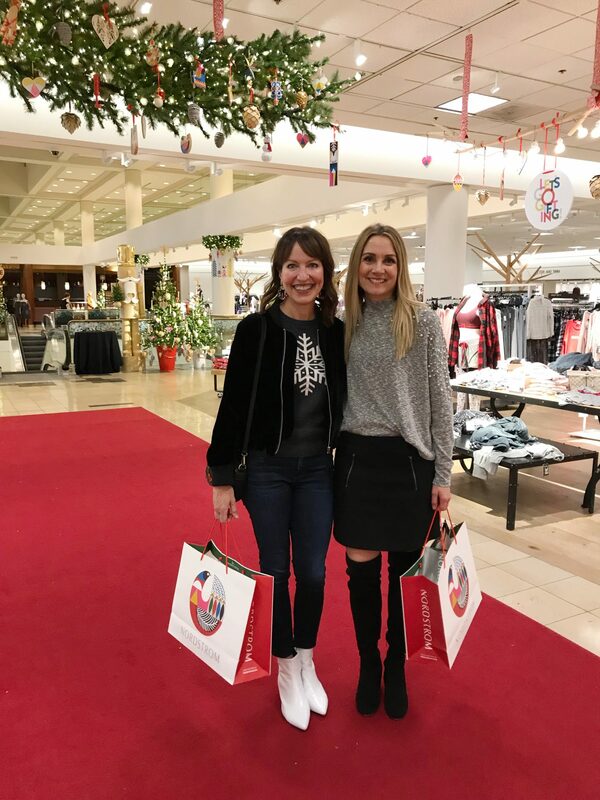 A fun winter sweater like Krista’s snowflake sweater is a subtle way to look festive without screaming Christmas or wearing an “ugly Christmas sweater.” Add nicer dark wash jeans, a velvet bomber jacket and white booties to finish off the look. Fair Isle sweaters are an on-trend option that is more unexpected but still has a festive vibe for the holidays. Layer underneath a faux fur coat for the coziest of December looks! Another casual outfit that can work for shopping, lunch or coffee dates is this red sweater with grey jeans. The red sweater, again, is a subtle nod to Christmas and these grey jeans are more dressed up and stylish with a stripe of velvet down the side. 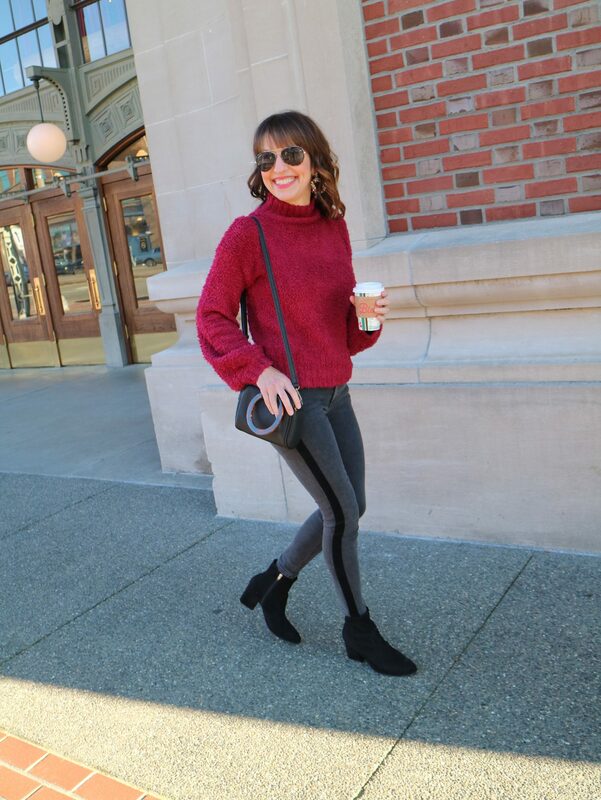 Krista keeps it casual for day with black booties, but this outfit can transition easily to night with a fun heel. It’s all about adding special touches when dressing for the holidays. 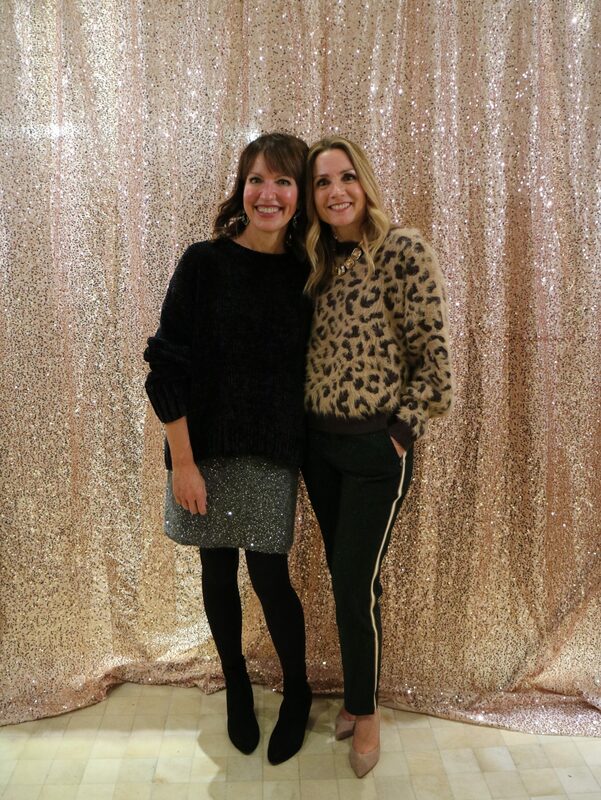 Julie’s embellished sweater is perfect for a holiday outfit but is versatile enough to be worn all winter long. Don’t feel like you have to keep within traditional Christmas colors either–soft pastels can be just as sweet for spreading holiday cheer. This amazing gold velvet skirt will work wonderfully for an event like Christmas Eve or a dressy/casual holiday party. Shoes in a festive color like these burgundy sock booties add pop to an otherwise simple outfit of a skirt and chunky sweater. Pair the same velvet skirt with a black bomber and black booties for a completely different yet elevated dressy casual look. Both outfits are comfortable yet stylish. Dressing special helps give significance to your holiday events! Make your holiday outfit better with unique details like pearls and plaid. Find a way to elevate your outfit and just say no to a boring outfit of a solid color top and pants. It’s fine to start out with that as your foundation, but add something–like shine (pearls or sequins), texture (like faux fur), or pattern (like plaid or a colorful scarf) to bring interest and a sense of joy to your look. 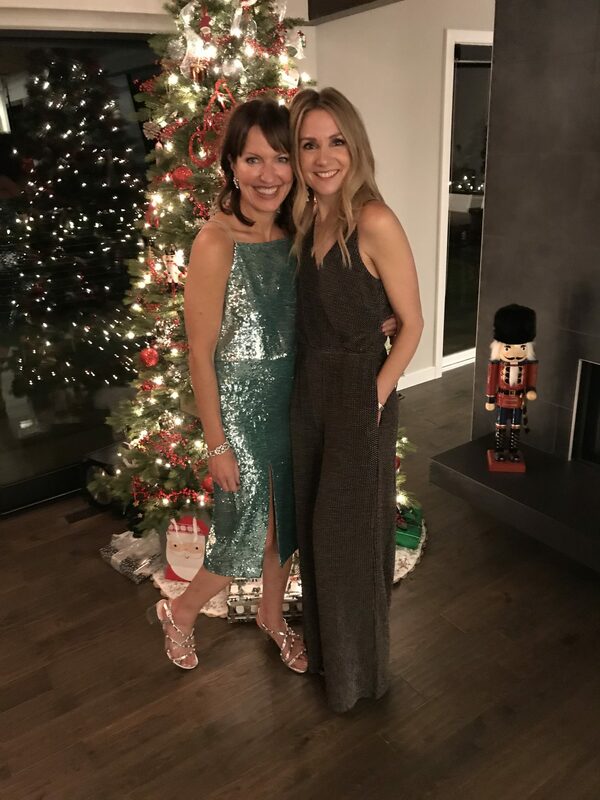 We wore these outfits to a holiday party in Seattle. We felt special but not too dressed up, that happy medium that works for so many occasions, from friends gatherings to church services to a night out. A soft sweater with a sequin skirt or side-stripe pants is warm, comfortable and Christmasy! sparkle + shine + don’t hold back! If you’re lucky enough to be invited to a dressier event during the Christmas season, seize the moment! These opportunities don’t come around very often, at least not for us! Krista stands out from the crowd in this turquoise sequin crop top and skirt. You’ll be glad you made the effort to shine when you get to your event. It’s so much fun to get this dressed up! 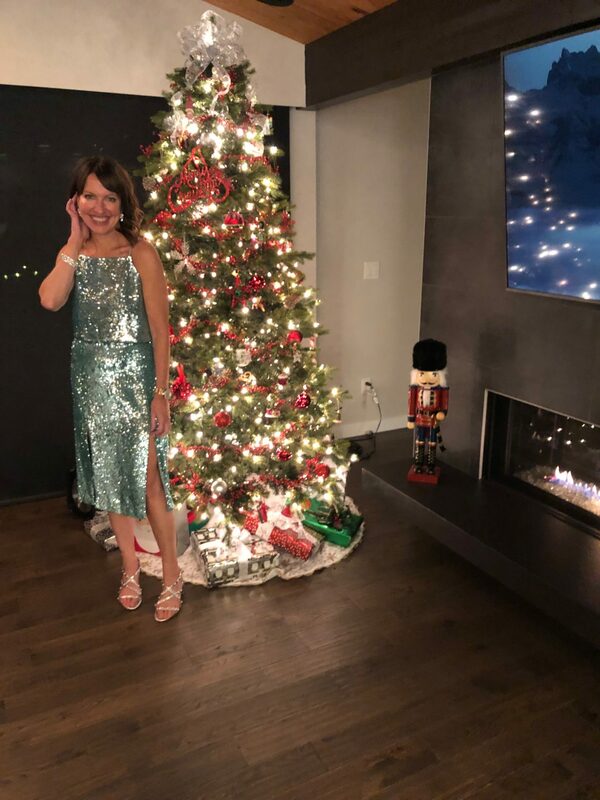 Julie shines in this sparkly jumpsuit that she plans to wear throughout the holiday season. The great thing about a jumpsuit is it’s comfortable plus it keeps your legs warm! A really dressy event comes around maybe only once a year. Live it up and have fun with it! In our casual society, our tendency is too feel like it’s too much, but we’ve learned that no matter the situation, there’s usually people wearing all levels of dressiness. We’ve learned that the biggest regret is not dressing up enough–that “missed opportunity”–and rarely is it the other way around!